The NH90 helicopters were ordered back in 2001, but won't be in full service until 2025. Despite calling the delay a "tragedy" and a "disaster," Defence Minister Frank Bakke-Jensen still ventured it was still the best option for Norway. A parliamentary hearing over faulty and highly expensive defence equipment procurement has started in Norway. No fewer than seven defence ministers and top military officials will be questioned on the fate of multi-purpose NH90 helicopters, national broadcaster NRK reported. The 14 helicopters were ordered in 2001 to the tune of NOK 11 billion ($1.3 billion). Today, 17 years later, only nine of the helicopters have been delivered. What's more, they remain mostly grounded due to "drastic maintenance needs and a severe shortage of spare parts". Realistically, the helicopters won't enter full service until 2025, that is a quarter of a century since being ordered. Norway's helicopter program started in 2000, when Defence Minister Bjørn Tore Godal's team, according to a critical report by the state auditor's office, instead of selecting a tried and tested helicopter model opted for an experimental one, even though not a single one had been produced at that time. The NH90 was developed by [four] European countries and is produced in [France, Germany, Italy and Spain]. The medium-sized, twin-engine aircraft was specifically designed for operation in naval environments. According to the initial plan, the NH90s were to be placed on Norwegian coast guard vessels and be used for search and rescue operations, as well as monitoring fisheries. However, problems began to mount. The first helicopters were due for delivery in 2005, but the prime contractor NH Industries, which had no production experience at that time, wasn't even close to being finished with them. Nevertheless, the contract, however, was maintained. The first helicopter didn't arrive until 2011, a decade after being ordered. At that time, Norway was reportedly close to severing the contract and choosing US Sikorsky Seahawks, only to find that breaking the contract would set the state coffers back as much as adhering to it. Meanwhile, problems continued to accumulate. The last of the Lynx helicopters that the NH90s were to replace were retired in 2014, meaning that Norway's Coast Guard, which is tasked with monitoring western Europe's longest coastline of 58,133 kilometres, has been left without operational helicopters ever since. The available NH90s were mostly kept grounded due to technical faults and spiralling costs. While the NH90 costs NOK 175,000 ($20,500) per flight hour, its rival the Sikorsky Seahawk only costs NOK 34,000 ($4,000) per flight hour, or five times less. Norway's incumbent Defence Minister Frank Bakke-Jensen minced no words about the problem-laden NH90, yet contended that it was still the best helicopter for Norway. "Saying it is a 'tragedy' and 'disaster' is fitting. It describes well a 20-year process during which we haven't had the helicopter capacity we should have", Bakke-Jensen said, as quoted by the newspaper Verdens Gang. Nevertheless, Bakke-Jensen also waved aside committee chairman Hans Fredrik Grøvan's sarcastic question about whether it has in hindsight become clear that one can make do with a VW and not a Rolls-Royce, and maintained that the NH90 best suited Norway's maritime needs. 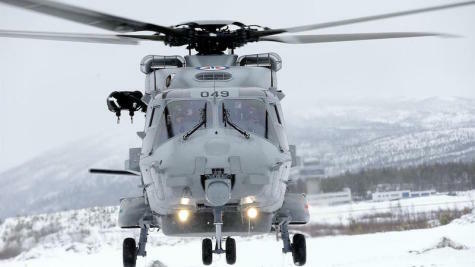 Initially, four Nordic countries agreed to buy the NH90, but Denmark later opted out, ordering US Seahawks instead in 2012. Norway, Sweden, and Finland, one the other hand, have all been plagued by massive delays and technical trouble.